This initiative is produced by Cooperatist Movement, Unify, Culture Collective, and Pōhāhā I Ka Lani. Please scroll to the bottom to see our partners who are playing various roles to help make this special event possible. The list is growing, so be sure to check back weekly to learn more! Pōhāhā I Ka Lani is our local non-profit beneficiary organization whose mission is to revitalizate and advance indigenous Hawaiian culture, founded in 2001 and incorporated as a 501(c)(3) non-profit in 2009. Pōhāhā I Ka Lani fulfil it’s mission and kuleana by stewarding land with the community to ensure the cultural knowledges and practices of this wahi pana are perpetuated. Our kuleana centers around the cultural kīpuka and wahi pana of Waipiʻo Valley on the Hāmākua coast of Moku O Keawe, Hawaiʻi Island. You can learn more about Pōhāhā I Ka Lani at their website or donate to the non-profit here. Kumu Harry Uhane Jim is a teacher of Lomilomi, he teaches the techniques that open us to healing in body and spirit. Through this practice we learn that physical healing is a small bit, that Lomilomi is emotional evolution, a gift from Spirit to humanity, available to all of us. “There will be no tests,” Kahuna Harry writes. “Nobody fails. Therein is your growth.” You can visit his Facebook Page to learn more. Collective Evolution is a grassroots organization created in 2009, CE is now one of the world’s most popular alternative media, production, and community outlets that gives readers an opportunity to reshape their everyday way of thinking. CE’s content ranges from full-length articles, to videos, to live events, all of which share one common goal: to raise awareness about how our world functions, and to encourage conscious change that moves beyond it. URI Cooperation Circles: Interfaith Cooperation Circles (CCs) are the heart of URI. Independently organized, self-governing and self-funding, they build cooperation among people of all faiths and traditions to address the most pressing issues facing their collective communities, including poverty, religiously motivated violence, environmental degradation and more. Cooperation Circles range in size from a minimum of seven members to tens of thousands, representing at least three faiths or traditions, including the non-religious, and subscribe to the shared vision outlined in URI’s Charter. They are connected to one another and the global URI network through eight regional anchor points, where regional coordinators help CCs build capacity, organize regional gatherings and trainings, and seed new CCs. URI’s global office in San Francisco provides support for regional leaders, maintains a global communications network, organizes conferences to bring CCs together from all over the globe, and supports three global initiatives, the Traveling Peace Academy, the Young Leaders Program and the Environmental Satellite. Autumn Sky Morrison Created the beautiful painting on our website splash page. 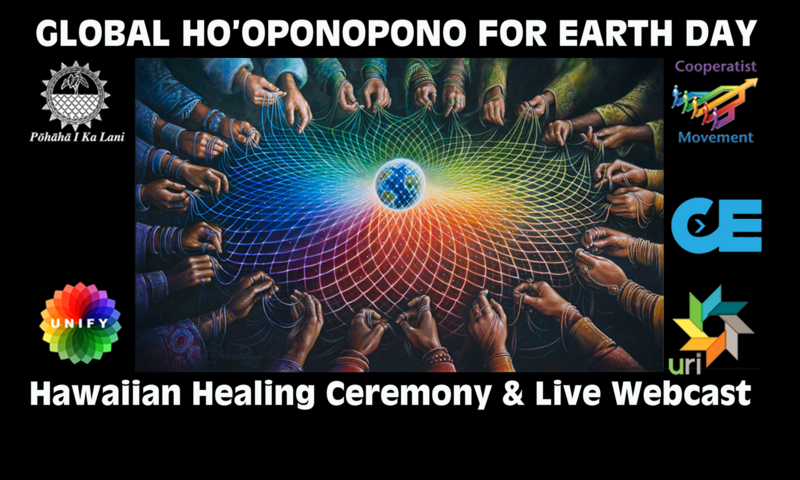 We wanted to honor the cultural roots of Ho’oponopono in Hawaii, but also represent that this event and ceremony is global, for everyone everywhere. Autumn’s painting expresses this sentiment to perfection! Four Worlds International Institute for Human and Community Development was born out of the intense deliberations and prayers during a gathering of native elders and community leaders. It was held on the Blood Indian Reservation on the high plains of Alberta in the last week of December 1982. Forty distinguished representatives of North American tribes met in search of a solution to the social devastation brought on by, alcohol, poverty and an increasing sense of powerlessness that was sweeping across tribal communities. This collection of individuals and organizations has continued to evolve through the decades supporting communities and nations in building a healthy and sustainable future for the human family. The International Coordinator of Four Worlds International Institute is Phil Lane, jr., a traditionally recognized Hereditary Chief and Elder enrolled in both the Ihanktonwan Dakota and Chickasaw Nations, and is a citizen of both Canada and the United States. UPLIFT Combining the gift of intimate live events with the power of the internet to reach the world, UPLIFT is a bridge of love and consciousness into real world action, guided by a fundamental vision of Sarvodaya – Sanskrit meaning: “Upliftment for all”.